Paintings and drawings. Betty trained in illustration at the Royal College of Art under Edward Bawden and John Nash. A short spell in the painting department under Carel Weight, Robert Buhler and John Minton had a profound effect on her subsequent work. 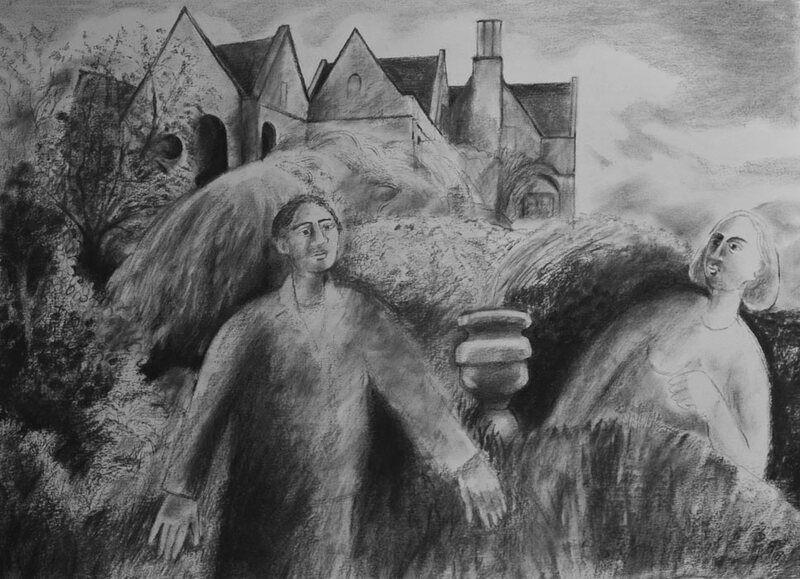 She is influenced by the landscape, making poetry in rural settings and enclosed gardens. 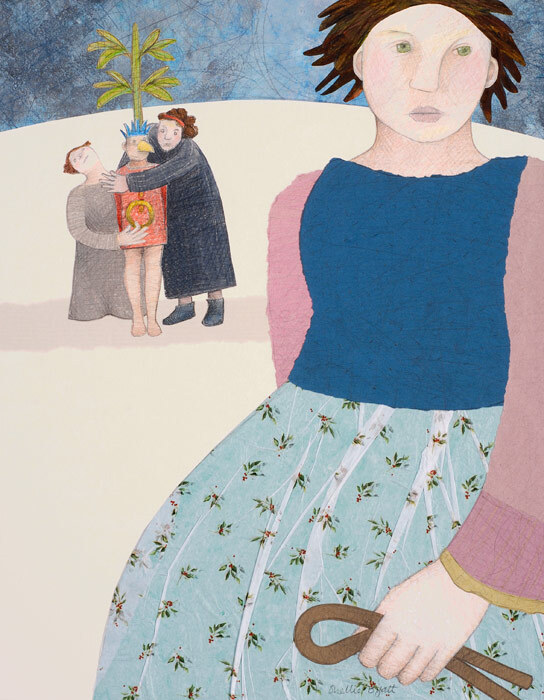 Her paintings are of great luminosity and rich, saturated colour; intrinsically beautiful, and peopled with isolated, ambiguous figures. They are extraordinarily accessible and immediate and in other ways they hold secrets. The content is strong and emotional, sometimes humorous, sometimes menacing, haunting and mysterious, evoking the spirit of the place. Betty’s idiosyncratic and visceral work conjures up a magical environment. Works on paper. Shellie specialises in distinctive, witty, uncluttered observations of the world. She is a narrative artist, producing quirky and intriguing images that tell tales of love and longing, misunderstanding and redemption… the complexities and riddles of human relationships. Inspired by poetry, song and folktales, such stories stand as metaphors for the deeper things in our lives. Shellie trained at Goldsmith’s and was fortunate enough to be taught by Betty Swanwick, head of illustration, and Constance Howard (known for dying her hair with green lithography ink and introducing the Beddlington terrier to Craigie Aitchison), both extraordinary and inspirational teachers and artists. Her works on paper are built up using collage, pencil, paint and ink, producing highly detailed images, subtle colour and seductive patterning. 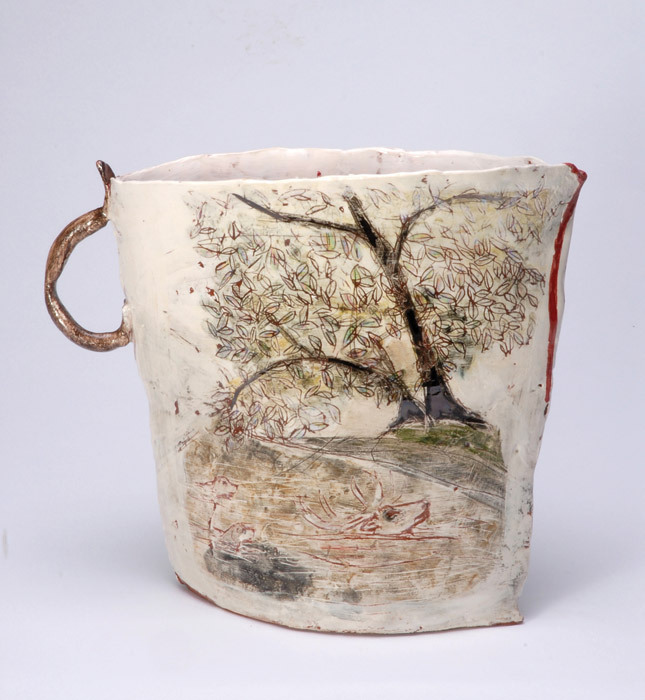 Jacqueline’s ceramic work draws inspiration from her natural environment. The pieces are extremely personal and solitary, displaying a simple and sometimes romantic narrative that is acquired from living within and exploring Exmoor on foot. She is particularly intrigued by the symbiotic relationship the deer have with the people of Exmoor. The handbuilt vessel form is prosaic rather than purely functional, with titles that are quite suggestive and evocative, inviting closer scrutiny. Surfaces are created through layers of colour and illustrations, the drawings being naive and sometimes primitive. Jacqueline studied for her BA and MA at Central St. Martins, where she was taught by Richard Slee, ‘the grand wizard of studio ceramics’, and Gillian Lowndes amongst others.